The life cycle is a fundamental feature of development. Individual biological organisms, ideas, products, technologies, organizations, political economies (fascism, communism) and any other developing system must trace out some form of life cycle growth in their capacity or impact (Y-axis) over time or cumulative experience (X-axis). Life cycle curves are called “B-curves”, because they look like a lower-case b, laying on its back. The “B” may also stand for biology, as all biological organisms are subject to this curve. Decline and recycling (death) is inevitable for all differentiated (cellularly specialized) organisms, though not for undifferentiated cells, like germ and cancer cells, or for primitive organisms made up of very poorly differentiated cells, like Hydra. Some people think that examples like Hydra suggest that human organisms could be immortalized. But biology doesn’t work that way. All complex organisms are on a life cycle curve, whether we like it or not. In many replicating systems, individuals are on life cycle curves (must eventually decline and be recycled), but many features of their populations are instead on S-curves, exponential curves, or are stable or immortal (stable for very long periods of time). For example, the disposable soma theory of aging explains why it makes evolutionary sense for aging to occur in body (soma) cells (have disposable individuals, each an evolutionary experiment) while germline cells (replicators) are “immortal” (keep developing, or optimizing) as long as that population continues to survive in the environment. Evolutionary pressures have selected our somatic cells to specialize, age, and be recycled, and there is no genetic fix for that outcome which humans could ever be smart enough to design. Perhaps the coming AI could eventually get smart enough to redesign our DNA, from the ground up, to make us the first ever continually neotenizing (rejuvenating) complex organism, but that would be much less interesting for us than merging with the AI (becoming postbiological), and it is a story for another time. The six phases of life cycle growth are the four we saw with S-curves (Initiation/Birth, Acceleration/Growth, Deceleration/Maturing, Saturation), a Decline/Senescence phase (falling capacity in aging or overdeveloped systems) and a Death/Recycling phase where the system dies, goes extinct or bankrupt, or is taken over by another system, and its resources are repurposed or recycled. GP (growth point), IP (inflection point), SP (saturation point) and DP (decline point) are points on the curve after which careful observers can notice that growth conditions have changed. In some B-curves, the decline and recycling phases of the life cycle don’t fall smoothly, but instead the system falls off a few cliffs (cusps), abrupt discontinuous drops in performance (picture right). The declining individual may suffer a stroke or heart attack, a declining corporation may lose its key talent, funding, market share, or go bankrupt. Depending on the foresight and ability of leadership, their level of risk tolerance, and luck, the later years of mature organisations may have small or large catastrophic events, sudden drops that level out into a new lower level of performance, then decline further at a later time. 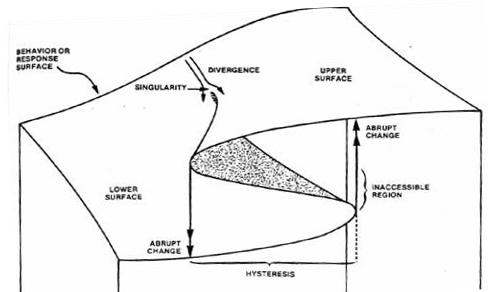 This topic is catastrophe theory, and it gives us a new curve, the C-curve (think C for catastrophe or cusp, or imagine the C-shaped overhangs created by potential catastrophes looming on the adaptive landscape. Good managers try to avoid catastrophic overhangs in all stages of growth. Such curves and their temporary discontinuities can emerge at any time, but they are particularly plentiful during intense competition, sudden resource scarcity, and in the last phases of the life cycle of many systems, thus we introduce them here. Sometimes you can’t avoid an impending catastrophe, but you can still see it coming, and you can have your plans ready when it emerges. The new growth economist Paul Romer famously said “A good crisis is a terrible thing to waste.” Very often, leaders, policymakers, and strategists can only get the resources and political capital they will need to institute their desired changes when they are operating in near-catastrophe situations, either when a catastrophe appears impending or one has just occurred. Perhaps the most important lesson catastrophes and crises teach is the way they strengthen our immunity, build intelligence, and accelerate innovation. This is critical insight is the catalytic catastrophe hypothesis, and we will discuss it further in Chapter 11. Raising the alarm about possible and probable catastrophes, having contingency strategies and plans ready for them if they occur, tolerating failures in order to maximize innovation, and driving the organization to the point where small catastrophes are always occurring, achieving a state called self-organized criticality, are all ways leaders can use catastrophe to gain advantage and be more adaptive. Let’s look at a few useful examples of life cycle curves now. One popular organizational life cycle model was developed over the last 30 years by management scholar Ichak Adizes. His Managing Corporate Lifecycles (2012), is a good introduction to the model and its foresight value. Knowing the organizational life cycle model can help leaders recognize and anticipate their normal stages of growth, maturity, decline, and renewal, and guard against common ways their firms may fall off the developmental path at each stage of the cycle. As John Kotter observes, organizations tend to naturally transition from networks to hierarchies over time. Once hierarchy and power centralization in the firm become excessive relative to the environment, organizational learning rates are no longer adaptive. Enlightened leadership or external stressors can then cause organizations to re-flatten, clear out their deadwood, and renew again. If that necessary swingback to the network state doesn’t periodically happen, the organization will become increasingly sclerotic, and eventually either die or be acquired for a fraction of its value by a better-run and often younger competitor. Adizes is to be commended for his pioneering work in thinking about organizations as developmental systems, and for inspiring others to further develop such models. The Adizes Graduate School offers online MAs and PhDs in Organizational Transformation and Change Management Theory, and a certificate program in Spiral Dynamics, another very insightful life cycle we will discuss shortly. Lex Sisney’s book Organizational Physics (2012), is a promising adaptation of Adizes that seeks to align strategy with both organizational life cycles and product/market lifecycles. Sisney models organizations on two axes: their responsiveness/agility versus their proactivity/foresight and their parts/individuals versus their whole/collective. 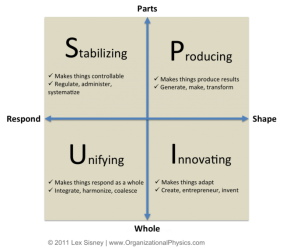 Sisney’s model proposes four common agendas for organizational strategy: engaging in Producing, Stabilizing, Innovating, or Unifying (PSIU) activities. He argues there should be different leadership priorities for these four agendas at different stages in the life cycle of the firm. As one example of their value, such models can help leaders wait to launch new innovations until their organic growth finally begins to mature, and do so in a manner that lets the new product or business grow as independently as possible, rather than be stunted or killed by too close an attachment to a mature, bureaucratic, or declining firm. For more, see this post outlining Sisney’s approach. Perhaps the most-used product life cycle approach is product life cycle management in engineering, which is the set of processes that guide a product or project through its user life cycle, from initial design to eventual disposal. One approach is life cycle cost analysis, to determine the future costs and net present value of various competing production strategies. Another is life cycle environmental assessments, to manage environmental impact. 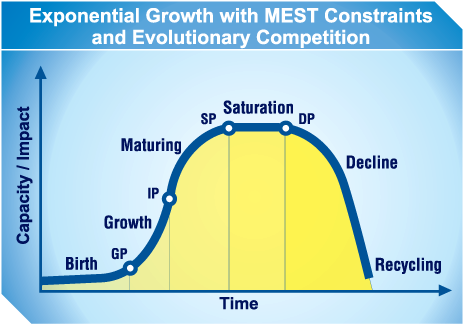 Yet another is life-cycle theory, pioneered by Raymond Vernon in the 1960s, which predicts that lowest-cost parts and labor inputs for successful products will increasingly globalize (a developmental process) and segregate into a set of highly adapted individual suppliers (an evolutionary process) over time, with only certain innovation-related inputs remaining in the country of origin. For an application of life cycle theory to Apple’s iPhone and iPad, see Kraemer et al., “Capturing Value in Global Networks” (2011). A complementary set of models for product life cycles is found in product life cycle management in marketing. 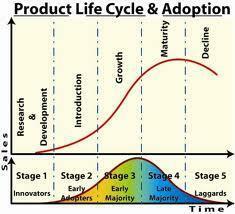 Here the life cycle is the various phases of market adoption in a firm’s product or technology life cycle curve, and the different sets of useful strategies as the product or technology moves from R&D, through Growth, into Maturity, and then Decline. As the phases progress, the specific features of the product or the technology itself become increasingly outmoded relative to newer, more attractive products or technologies, and only niche applications remain. The generic product market life cycle curve, with sales or other measure of relative value on the Y-axis and the product life cycle phases on the X-axis, is a logistic curve (S-curve) that is followed by a phase of decline, and the potential for renewal with a new product, giving a “hump-shaped curve” (pictures above and right). Analyzing the phases of this curve, innovation scholar Everett Rogers sorted adopters of new products and technologies into five common demographics: Innovators, Early Adopters, Early Majority, Late Majority, and Laggards, on a normally-distributed frequency curve (picture left). For more on the market adoption life cycle, see Everett Rogers’ classic, Diffusion of Innovations (2003), and Geoffrey Moore’s Crossing the Chasm (2014). The latter helps innovating companies with business strategy for the transition from Early Adopter to Early Majority consumers. 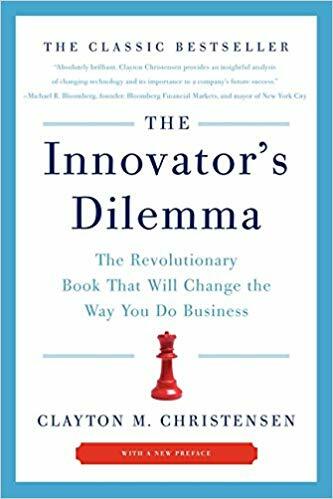 In The Innovator’s Dilemma (2011), management scholar Clayton Christensen explores how difficult it is for otherwise well-run, leading organizations to maintain market leadership when they reach Maturity in their lead products or technologies, and are suddenly faced with disruptive new products and technologies from upstart competitors. Renewal in such cases is difficult, and requires the ability to abandon and unlearn traditional processes and priorities, flatten opposing political hierarchies, and make organizational bets with products or technologies that are often immature, low-margin, poor quality, and worse in other significant ways than those of the current market leader. Mature firms that can’t make such entrepreneurial and change management moves are increasingly likely to lose their market to others. One of the particularly insightful points made by the Innovator’s Dilemma is the observation that market leaders become, by the natural consequences of their market success, counterinnovative. Their best innovation strategy becomes to “innovate and wait.” They try to get to the future first, then patent or acquire it, sit on it, and continue to sell the market their old, mature and increasingly outmoded technology for as long as they can, maximizing their return to shareholders. His theory also explains why this kind of systemic behavior is difficult for large firms to change even when the firm’s leadership deliberately sets out to change it. Such an innovation-averse strategy is simply good, defensible, profit-maximizing behavior for these firms. With the exception of a small cadre of large firms whose missions and business models revolve around innovation or openness, market leaders work on releasing disruptive innovations to market only when forced to do so, typically by small to mid-sized firms who either have gained or imminently threaten to gain a strategically significant percentage of market share, such as 2-5%, from the (usually large) market leader. Thus it is only the cadre of smaller and market share minority firms in any industry who are structurally motivated both to out-execute and out-innovate the large, market-leading firms, as the latter have little to gain and much to potentially lose from disruptive innovation. James Hasik’s Arms and Innovation (2008), documents the far superior innovation performance of smaller competitors in the defense industry, and equally compelling examples can be cited in every major industry. So if you care about innovation, either as a consumer, a foresight leader, or an organization, a top strategy is to include a number of competing small firms in your purchasing decisions as natural catalysts to keep the market leaders honest and continuing to improve. Improving is something they are less and less prone to do the larger and more life cycle mature they become. 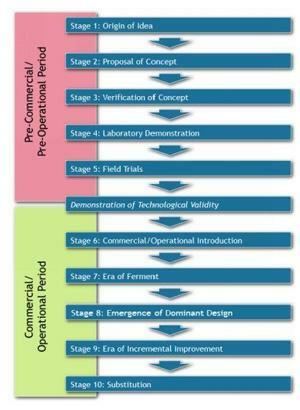 Business and technology foresight professional Peter von Stackelberg has developed an elegant ten-stage life cycle model for technology invention, commercialization, and eventual retirement (pictured to the right). It is a synthesis of two models by other scholars, one of which covers the pre-commercial and the other the post-commercial phases of technology diffusion in society. See von Stackelberg’s ebook Technology and the Future: Managing Change and Innovation (2014), for more. This book also includes another brief tutorial on patterns of change (exponential growth and collapse, S-curves, and chaotic behavior) in technology adoption and diffusion. Sometimes a set of small catastrophes is way worse in eliciting adaptive response than a single large one. Again, an example from biology: The basis for cell therapy of chronic diseases is to add stem cells “from the outside” to defeat/correct/cure. At the same time, every organism (except the ones severely irradiated or chemicated) contains its own stem cells in all the ‘right’ places. And yet autologous stem cells work only to repair acute injuries. Why? That is why chronic inflammation, when the system is locked into an unhealthy state, is so bad and so difficult to resolve. To sum up, counter-intuitively: adaptation, loss of sensitivity to chronic stressors, be it low-level but persistent pollutants or a toxic element of organisational culture, can be more detrimental than a single large catastrophic effect. Hysteresis is a very broadly encountered phenomenon. The Adizes Graduate School link seemed to be broken when I tried it. Maybe it should be http://adizesgs.org ?